DANE (1) was built in 1854 by Charles Lungley & Co. at Deptford Green in London with a tonnage of 530grt, a length of 195ft, a beam of 25ft 1in and a service speed of 9 knots. Sister of the Briton she was, on completion, immediately chartered to the French Government for use in the Crimean War. In 1856, due to a surplus of coal, she was laid up at Southampton with the intention of using her for the November sailing to South America but this voyage never materialised. 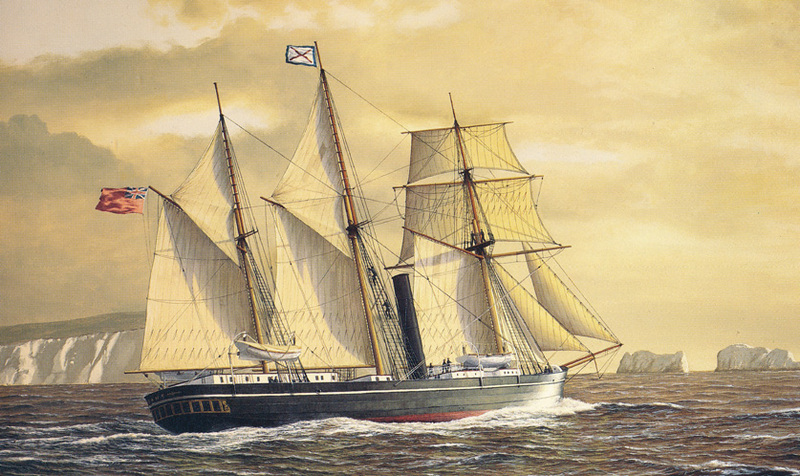 On December 1856 her owners were re-styled Union Steamship Company. In 1857 she followed the Union and the Norman onto the Rio de Janeiro service and on 15th September of the same year and under the command of Capt Strutt she undertook the first voyage to the Cape Colony with the mails. For this purpose she was given a red funnel with a broad black top, a livery that was applied to all the Cape Colony mail ships. In 1863 she was placed on the new coastal service followed, in 1864, by the Mauritius service. On 17th May 1865, whilst at anchor and during the 'Great Gale', she was holed by a drifting sailing ship. In the same year she was chartered by the British Government to carry troops to Zanzibar where they were used to suppress slave trading. 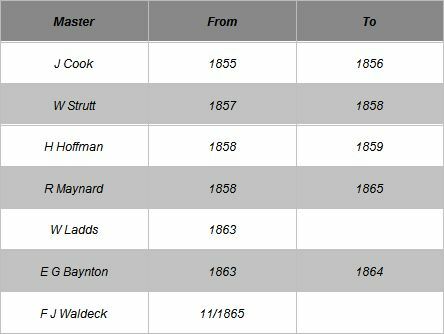 On 28th November 1865 she went ashore whilst approaching Port Elizabeth on a voyage from Simonstown and on 4th December became a total loss. On Saturday morning we received the following telegram from our Port Elizabeth agent. “The Dane struck on Dekeeder Reef from hugging shore too closely. “ Weather beautifully fine and passengers and crew were got into boats without much difficulty, and picked up by the shore boats. “ The Saxon proceeded to the wreck last night, but was unable to save any of the cargo. “ The Dane’s foremast went overboard before her officers left, and she has since broken up and sunk. “ Very few private effects were saved. The following telegrams were received on Saturday from Mr. Farmer by Messrs Anderson and Co.
“Wrecked steamer Dane broken up and nothing of her visible save engines. “Beach strewn with wreck and casks for three miles. Not seen Waldek yet. “Sent (????) with Sharp and Harris to save any cargo washed up. Waldek just arrived from Recif. Reports that Dane being under sail and steam – he being on deck all the time – struck on a reef this side of (Recife? ), one and a half mile from shore, and not marked on chart, lead showing five fathoms. Hogged and (fished?) instantly and engine (forcing?) through decks. “Part of mails washed up. “Messrs William Anderson and Co. received a further telegram yesterday morning stating that cargo continues to be washed up but in a very damaged condition, and the wreck and salvage to be sold today. The following telegram received from the Post Master of Port Elizabeth, having reference to the mail by the steamer Dane wrecked on Friday last on Cape Recif (as?) published in (???????) Gazette. The mail service was later extended to Algoa Bay, (Port Elizabeth) and then to East London and Port Natal, (Durban) which, as with Table Bay, Algoa Bay as only an anchorage. It would be some years before the mail ship could cross the bar into Durban harbour. For the best description of life aboard these early mail ships, you can do no better than to read ‘My Life at Sea’ by Captain William Caius Crutchley, R.N.R. published by Chapman & Hall, 1912., now obtainable as a reprint. The very well known "Every Thursday afternoon at four o'clock" sailings advertised by Union-Castle for many years may well have its foundation from the very beginnings of the Union Line, it is surprising how oftten their ships were advertised as sailing from Cape Town at 4 p.m.! Information from the 'Cape Argus', (South African Library, The Gardens, Cape Town). I have used the prefix R.M.St., the usual prefix for the times, when sailing vessels far outnumbered steam ships which, being less weather dependant earned premium rates for cargo and passengers. The advantages of steam are unquestionable, but the early steamers used their sails to conserve coal and find that bit of extra speed whenever possible. But Captain Crutchley makes the point that by the time he joined the Union Line, most of his fellow officers were 'steam men', not sail.